Several hundred thousand people turned out on Saturday for rallies across the United States to denounce the Trump administration’s policy of persecuting immigrants and asylum seekers. Protests took place in more than 700 locations, with the biggest crowds in Los Angeles, Chicago, Washington and New York City. The protests were particularly directed at the separation of thousands of immigrant children from their parents, carried out as a consequence of Trump’s “zero tolerance” directive requiring the arrest of anyone suspected of entering the United States illegally. The biggest demonstration was in Los Angeles, home to the largest immigrant population in the United States. More than 75,000 people surrounded City Hall in a crowd so dense it was difficult to move through it. By contrast, only 20 people showed for a miserable pro-Trump counterprotest that was given undue attention by the local news media. 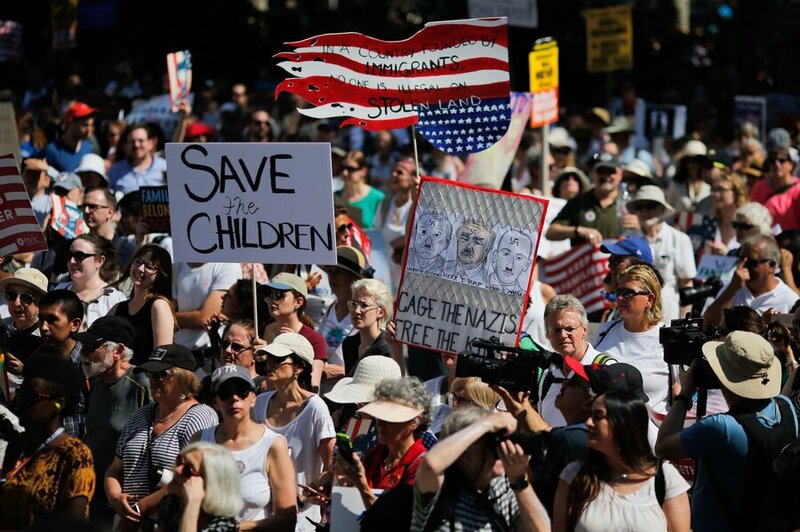 Protesters, outraged by videos of young children crying after being forcibly separated from their parents, continued arriving at the demonstration in a continuous stream throughout the course of the day. There was widespread support for placing Trump, Stephen Miller, Jeff Sessions and other cabinet figures on trial for crimes against humanity. Others called for the abolition of Immigrant and Customs Enforcement (ICE) and other repressive instruments of the anti-immigrant dragnet. “Human Rights should have no border” was a common slogan on placards throughout the rally. Celebrity entertainers and Democratic Party politicians dominated the platform and sought to direct the outrage over the abuse of immigrants and separation of parents and children into support for the Democratic Party in the November congressional elections. Los Angeles Mayor Eric Garcetti spoke about the need for ICE and immigration officials to simply “follow the law.” Democratic gubernatorial candidate Gavin Newsom spoke of the rich history of diversity in California, while pledging to do nothing whatsoever to protest Trump’s anti-immigrant policies. In one of the largest demonstrations, over 50,000 rallied in Chicago, according to crowd estimates by the city police department. 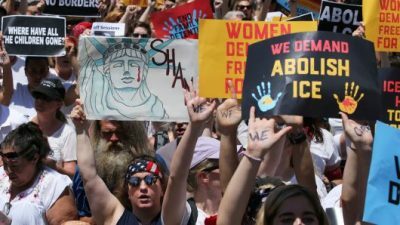 Braving intense and dangerous heat, wide layers of the population—high school and college students; immigrants and their families; teachers, nurses, and state workers; sections of the middle and even upper-middle class—turned out to express their opposition to the Trump administration’s barbaric anti-immigrant policies. There was a similar turnout in New York City, with marches in both Manhattan and Brooklyn. A crowd of demonstrators filled Brooklyn Bridge from end to end for more than two hours as they marched across the East River. Some 15,000 people gathered at Government Center in Boston, where the speakers platform was dominated by Democratic politicians, including senators Elizabeth Warren and Ed Markey and Representative Joe Kennedy, all promoting a vote for the Democrats in November. The Massachusetts Secretary of State office had a table set up to register people to vote. There were sizeable protests in many regional centers, such as Atlanta, Denver and Dallas, where five people were arrested outside an ICE facility; at mid-size cities like Pittsburgh, New Orleans, Albuquerque and Salt Lake City; and even in small interior towns such as Redding, California, and Huntington, West Virginia. In El Paso, Texas, a large crowd blocked the bridge across the Rio Grande to Juarez, Mexico. There were organized protests in all 50 states. At what was billed as the main national rally, in Washington DC, the march organizers, from MoveOn.org, the American Civil Liberties Union and the AFL-CIO-backed National Domestic Workers Alliance, made the decision to have the “vote in November” argument made exclusively by entertainers, ministers and activists representing various “identities”—black, Hispanic, Asian, female, etc.—rather than having any leading Democrats on the platform. This was done in part out of concern that the crowd might not react favorably to such figures and in part because top Democrats did not want to associate themselves in so public a way with the defense of immigrants. But the absence of Democratic politicians from the platform in Washington did not change the message, as speakers repeatedly led the crowd in chants of “vote them out.” Not one speaker criticized the role of the Obama administration in carrying out mass deportations—more than any previous government—and setting the stage for the brutal escalation of attacks by Trump. The speakers list in Washington aimed to reinforce the efforts of the Democratic Party and its pseudo-left supporters to split the working class along the lines of race, religion, ethnicity and gender. Not a single speaker claimed to represent the working class or speak in the name of the vast majority of Americans who are united as part of that class. The reactionary ideology behind this lineup was given voice by one speaker in particular, Rev. Traci Blackmon of the United Church of Christ, an African-American pastor from St. Louis. She presented the entire history of the United States as one of white oppressors ripping children away from nonwhite parents: from enslaved black women to Native American families, Japanese-Americans in World War II and parents locked up in the prison system, whom she called “predominantly black and brown,” despite the fact that working-class whites make up a large proportion of those in jail. This presentation was explicitly racialist, as the preacher spoke of breaking through the “iron curtains of white nationalism” and claimed the motivation for the attacks on immigrants was that “The false god of whiteness is threatened.” There were no protests from the platform against this type of language, nor any attempt to assert the unity of white, black and other minority working people in a common struggle. While the speakers in Washington and in other major cities covered up the role of the Obama administration and sought to turn the defense of immigrants into an electoral campaign for the Democrats, those attending the rallies were extremely receptive to a socialist alternative. Supporters and members of the Socialist Equality Party intervened at many of the rallies around the country and found enormous support for the SEP’s call to unite the working class against all the politicians of the capitalist class, whether Trump and the Republicans or the Democrats, who serve as the second line of attack against immigrants. At some of the smaller rallies, where the platform was less strictly controlled by groups affiliated with the Democratic Party, SEP members were able to speak and declare the party’s support for open borders, the freedom of all workers to live and work where they choose, and against the subordination of the working class to big-business politicians and parties. In those cases there was a warm response to the policies advocated by the SEP and clear indications that working people are increasingly interested in a socialist perspective and eager to discuss it. Featured image is from CNBC.